Shop for genuine replacement snow blower parts for your single-stage or two-stage snowblower. At RCPW, we carry a huge selection of discount snow blower parts for sale, including all of the big name manufacturers, like Honda snow blower parts. We also sell Toro, Ariens, Murray, MTD, Husqvarna and tons more. RCPW has the brands you need, with a massive collection of replacement parts, accessories and components. What type of replacement part or component do you need? From snowblower belts to snowblower tires, and literally everything in between, we have an unmatched selection and fantastic prices. We always have the most common repair parts like scrapers, paddles, shear pins and other commonly ordered components so we can get that to you quickly. We also sell aftermarket snow blower parts. It's easy to browse our store by brand or search to quickly navigate our available selection. Or you can call our expert team at 800.937.7279 and we'll help you find exactly what you're searching for today. We'll help you get your snow blower back up and running as quickly as possible, and you can always be confident when you shop with the RCPW experts. Have your snowblower part number ready? 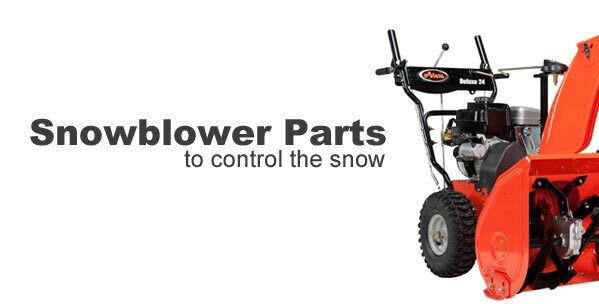 Search for it above to find the replacement snowthrower part you need! Whether you're looking for a replacement housing or just a small shear pin, RCPW is sure to have what you need. We've been in the lawn and garden industry for over 35 years and our knowledge of equipment and replacement parts is top notch. Begin looking for your replacement snowblower parts today using our free parts lookup or give us a call at 800-937-7279 if you can't find the right item you need.